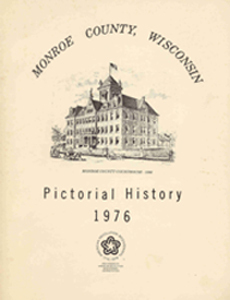 Monroe County Pictorial History, 2nd edition, 2004. 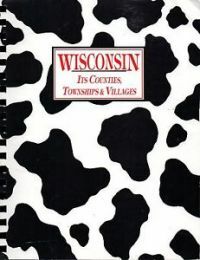 THE book to go to for our county’s history. Originally published in 1976, this book has been our best seller. It’s loaded with stories, histories, and photographs of Monroe County’s earliest towns, villages, settlers, places, and events. This new edition includes an EVERY NAME INDEX! 450 pages. 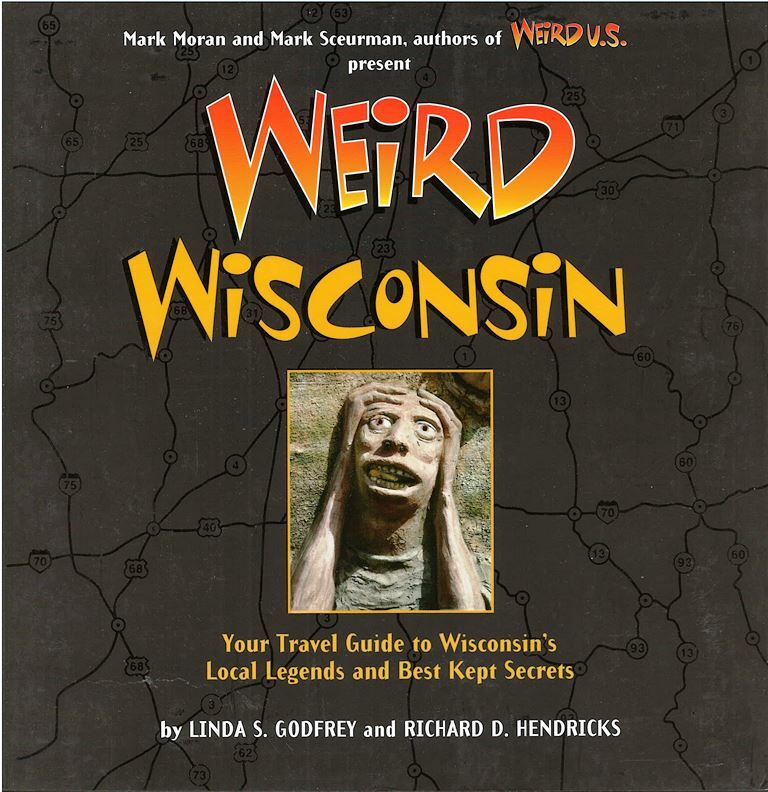 Weird Wisconsin: Your Travel Guide to Wisconsin's Local Legends and Best Kept Secrets by Linda S. Godfrey and Richard D. Hendricks; Mark Moran and Mark Sceurman, Creative Directors. Features colored photographs and information about many of the weird and wacky sites from around the state. Sure to be a fun read for kids and adults alike. Softcover, 272 pages. 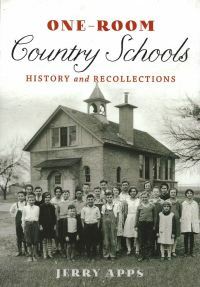 One-Room Country Schools History and Recollections book by Jerry Apps. Throughout its history, Monroe County, like other counties in Wisconsin, had over 100 one-room rural schools. 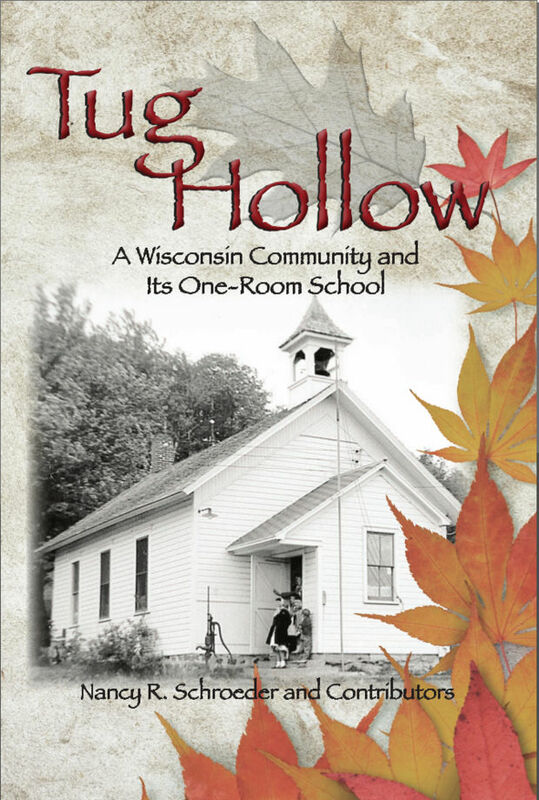 In this book, well-known author Jerry Apps describes what it was like attending a one-room school as a child. From the teachers and textbooks to the Christmas pageants and school picnics to the fun games played at recess, the book recalls the nostalgia of that now gone era. 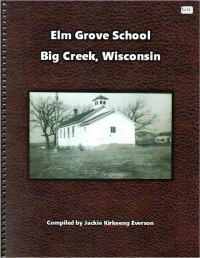 Includes several black and white photos of rural schools throughout Wisconsin. Softcover, 233 pages. 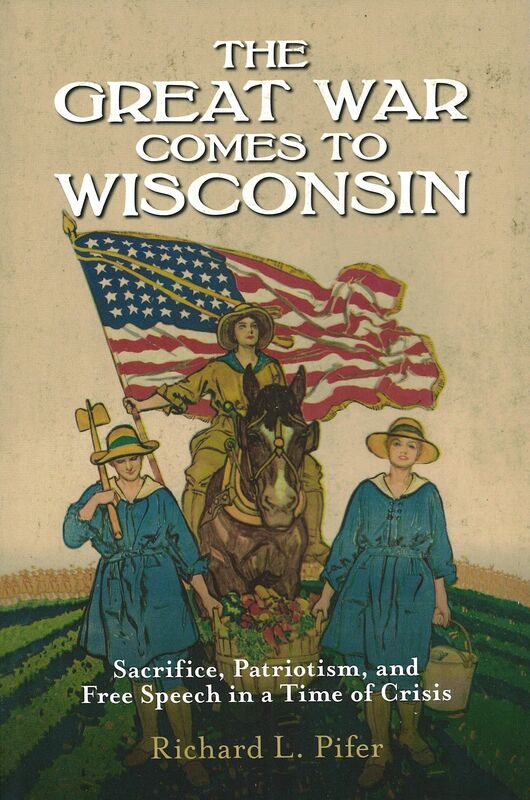 Examine Wisconsin’s response to World War I in author Richard L. Pifer’s book "The Great War Comes to Wisconsin". Often called "The War to End All Wars” or "The Great War,” World War I was the first "total war” of the twentieth century, a war so large that it engaged virtually the entire world. This book captures the homefront war experience: the political debates over war policy, the worry over loved ones fighting overseas, the countless everyday sacrifices, and the impact of a wartime hysteria that drove dissent underground. 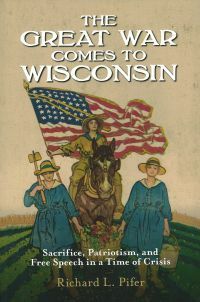 The book also includes letters and accounts of Wisconsin’s famed 32nd Division. 286 pages, b/w photos. Softcover. 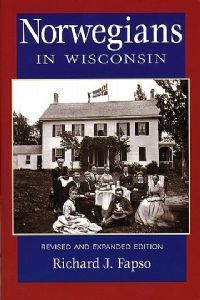 Meet the mayors, ministers, mystics, murderers, & more whose lives influenced and defined the state of Wisconsin in these brief biographies from the past. 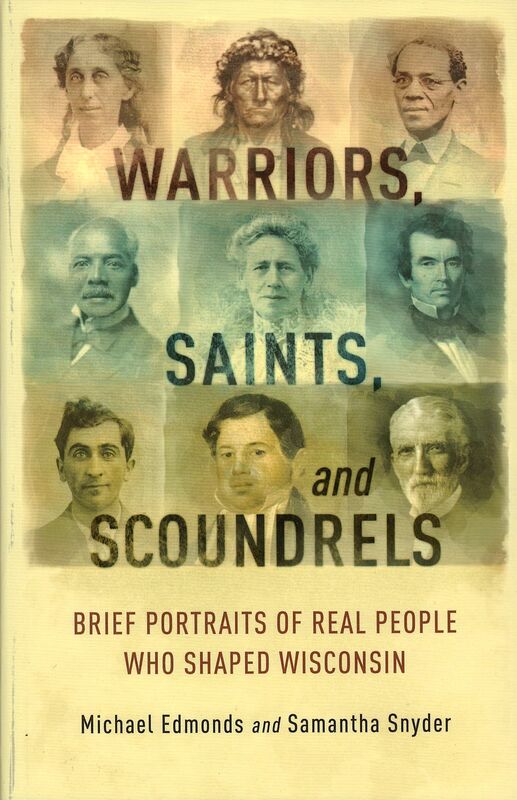 Co-authors Michael Edmonds, the Wisconsin Historical Society’s Director or Programs and Outreach, and Samantha Snyder plumbed the depths of the Wisconsin Historical Society’s collections to research and compose lively portraits of eighty of these notable individuals: mayors, ministers, mystics, murderers, and everything in between. Among them are a governor who saw ghosts, an incorrigible horse thief, a husband and wife who each stood over seven feet tall, an American Indian chief who defied forced removal, the first woman to practice law before the Supreme Court, and even Chief Tomah after whom Tomah, WI is named. Each story is followed by recommended sources for readers’ continued exploration. 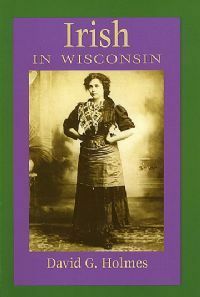 Whether read on the fly or all in one sitting, these short, colorful narratives will intrigue and inform as you delve into Wisconsin’s diverse and diverting history. 219 pages, b/w photos. Softcover. 1912 “History of Monroe County, Wisconsin, Including an account of the Cities, Towns and Villages of the County” by Randolph A. Richards. 1977 reprint featuring an every-name index. Provides a comprehensive overview of the history of the county from the early years of European exploration and settlement. Topics covered include Indians tribes, the Black Hawk War, early settlement, railroads, newspapers, Monroe County residents in the Civil War and the Spanish American War, agriculture and dairying, banks, manufacturing and business, the legal and medical professions, civic and social organizations, businesses and industries, schools, and churches. 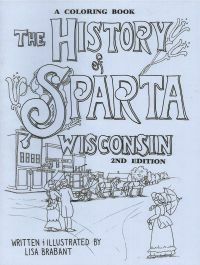 Histories of the cities, towns, and villages of Sparta, Tomah, Cashton, Kendall, Wilton, Norwalk, Adrian, Angelo, Byron, Clifton, Glendale, Grant, Greenfield, Jefferson, Lagrange, Lafayette, Leon, Lincoln, Little Falls, New Lyme, Oakdale, Portland, Ridgeville, Sheldon, Wells, Wellington, Wilton, and Scott are included, as are biographical sketches of county residents. Hard cover; used in very good condition. 946 pages. [Note: This is an extra copy donated as a fundraiser]. 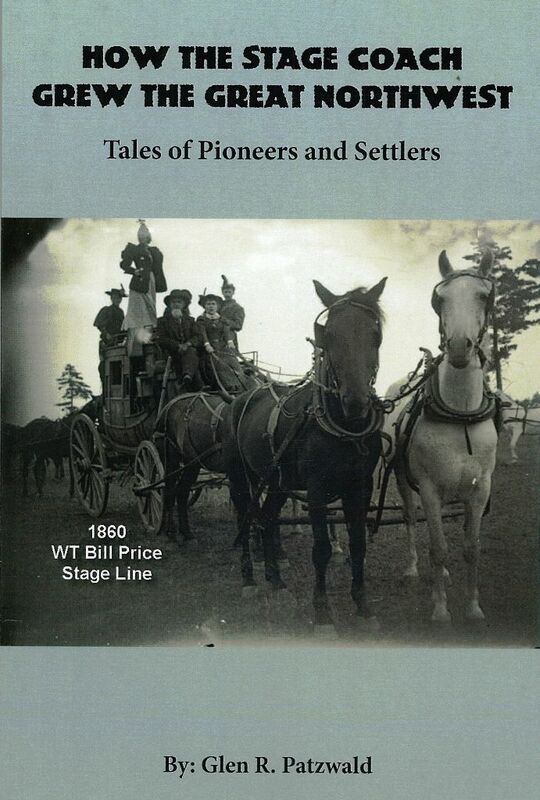 How the Stage Coach Grew the Great Northwest: Tales of Pioneers and Settlers book by Glen R. Patzwald, 2018. 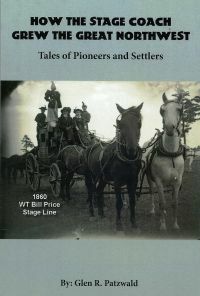 Includes information about many of the early stage coach roads and lines that ran thru early West Central Wisconsin--including Monroe County. The book also includes several black and white photographs and maps. Softcover, 107 pages. 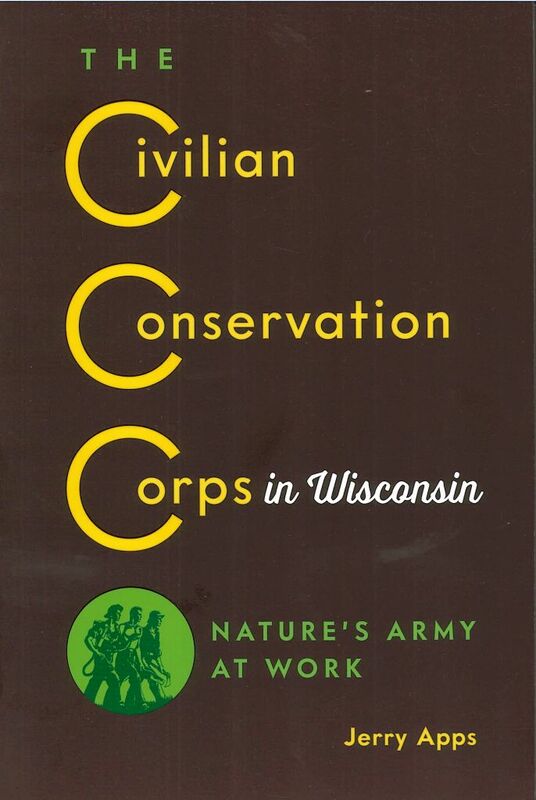 The Civilian Conservation Corps in Wisconsin: Nature's Army at Work book by Jerry Apps. 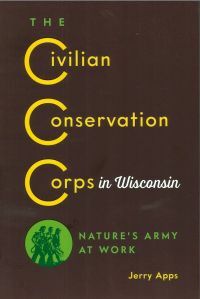 Nearly one hundred thousand young men served in the Civilian Conservation Corps (CCC) in Wisconsin between 1933 and 1942 during the Great Depression. Sparta even served as the main district headquarters. In this book, acclaimed author Jerry Apps explores the history, environmental impact, and lasting legacy of the CCCs in Wisconsin. Softcover, 212 pages. 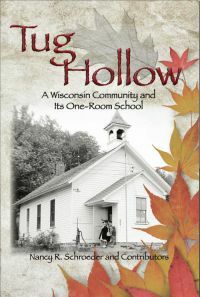 A history of a one-room school near Oakdale, Monroe County, WI, and the community surrounding it. Written by Nancy R. Schroeder and contributors. From the back cover: “The book is a factual account, with many anecdotes, about a valley of small farms in Wisconsin and the school that was so important to the people who lived there.” Dozens of historic black and white images. 316 pages. The Amish have been in Monroe Co., WI, since 1966. Learn more about their customs, history, and beliefs from the author who works closely with Cashton, WI area Amish families. 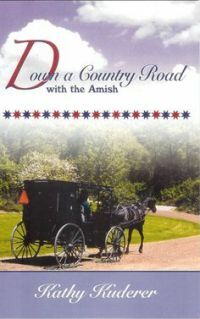 Author Kathy Kuderer shares from the heart her knowledge, friendships and experiences of knowing the Amish in a very personal way. Softcover, 81 pages. 1994 edition of Wisconsin Its Counties, Townships & Villages compiled by Wendy (Zastrow) Uncapher and Linda (Zastrow) Herrick. 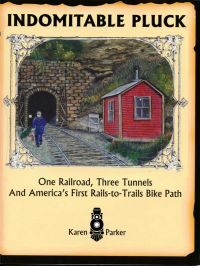 From the introduction: "The purpose for this book is to show township relationships and list as many towns (incorporated or unincorporated), railroad depots and post office names as could be identified." As town lines and names change, this book can be a helpful resource to determine where a place was once located. 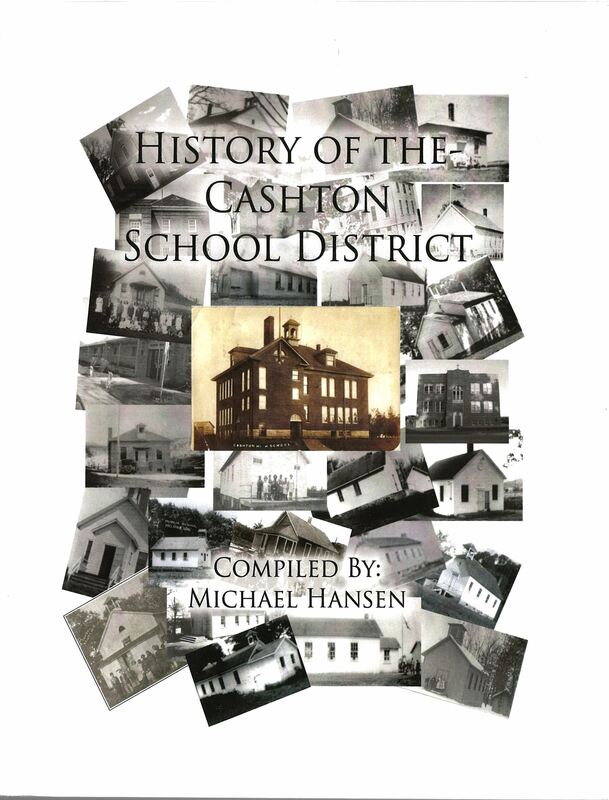 2015 edition of Michael Hansen's History of the Cashton School District. Includes brief histories and photos of over 30 schools in Monroe, La Crosse, and Vernon County that were at one time part of the Cashton School District. A map of the schools' locations is also included. Softcover, 207 pages, new condition. Book, "Windows To the Past and then Some" by Paul Mitby, printed by Evans Printing in 2014. Contains numerous photos (black and white and color) as well as many of the author's memories and stories about growing up in the Cashton area. 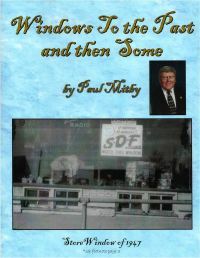 In particular, the book covers the family's business from its early founding by Lester Mitby in late 1945 until, generally, the present day business operation in Cashton. Signed copy; in excellent condition; 60 pages. 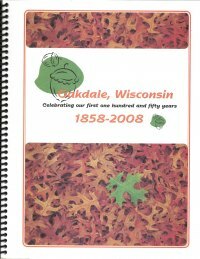 "Oakdale, Wisconsin 1858-2008: Celebrating our first one hundred and fifty years" book compiled by Barb Ackerley for the Friends of Oakdale and published by Dairyland Power Cooperative in 2008. 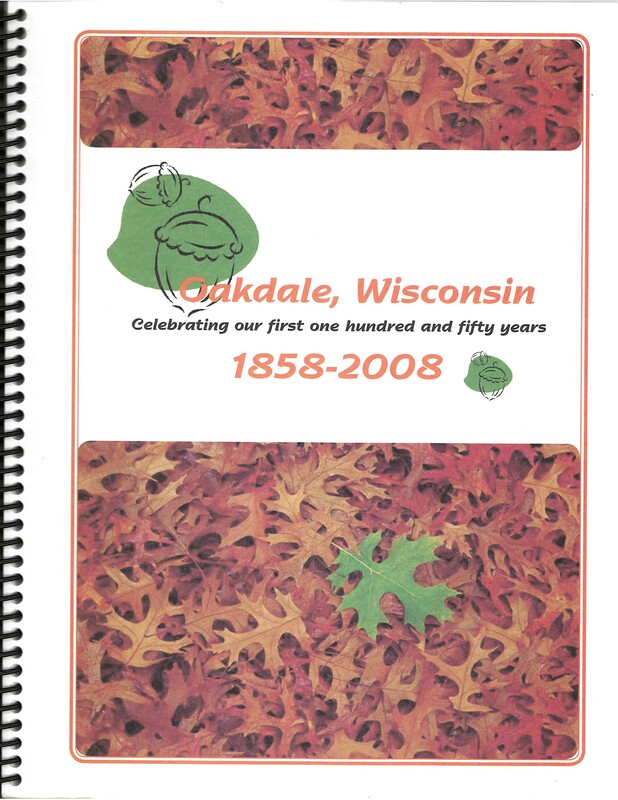 Contains historical information on Oakdale's geography, founding, schools, families, businesses, and organizations. Numerous photos are also included. Spiral-bound, 103 pages. Good condition. [Note: this is a duplicate copy sold as a fundraiser]. 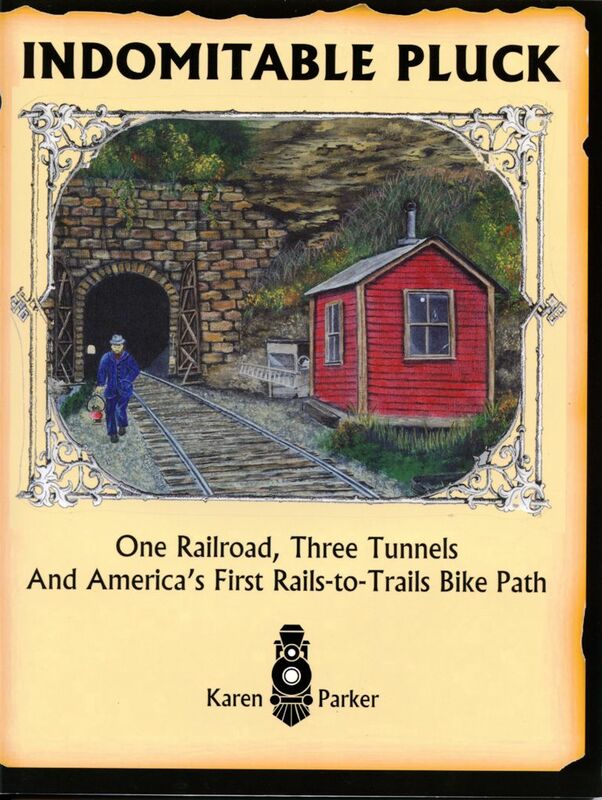 Although hundreds of thousands of bikers and hikers have enjoyed the Elroy-Sparta Bike Trail since it opened in 1966, few know the history behind this unique 32-mile stretch of old Chicago and North Western rail bed. In “Indomitable Pluck,” author Karen Parker reconstructs the story of the people who drilled three tunnels and forged a path through the rocky hills of Wisconsin's Driftless region, forever changing the local pioneers' lives. Dozens of historic black and white images. 99 pages. 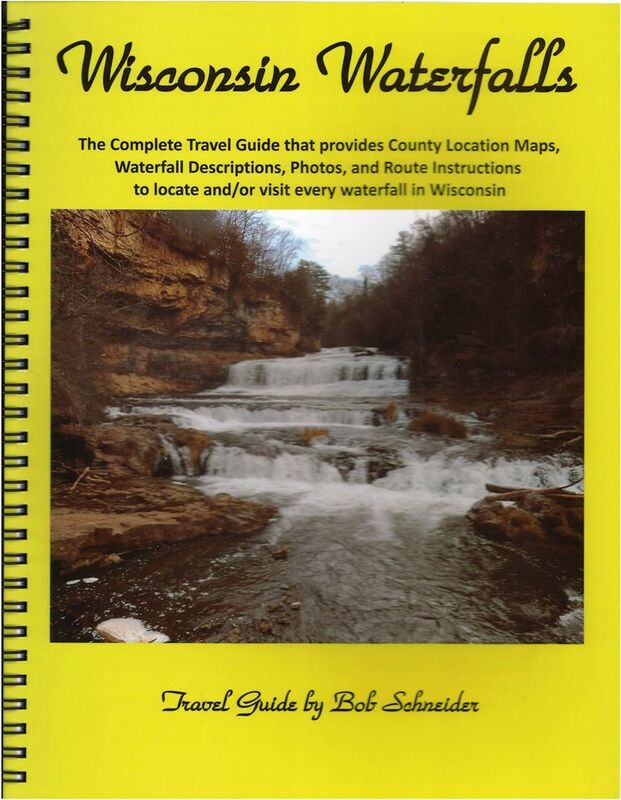 "Wisconsin Waterfalls: The Complete Travel Guide that provides County Location Maps, Waterfall Descriptions, Photos, and Route Instructions to locate and/or visit every waterfall in Wisconsin" by Bob Schneider, 2018. 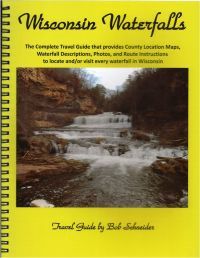 The book documents 185 waterfalls in Wisconsin--including Cascade Creek Falls in Monroe County. It includes color photos, maps, and GPS coordinates for the waterfalls. Spiral-bound, 88 pages. The 3rd largest immigrant group to settle Monroe County, the Irish have a rich and long history in Wisconsin. Immigrants quickly formed communities, settling in Wisconsin cities and small towns, influencing them with their old country charm. By David G. Holmes. Paperback; 92 pages, 23 b/w photos. The majority of 19th c. immigrants into Monroe County came from Germany. Between 1820 and 1910, nearly 5.5 million German immigrants came to the US. Most settled in the Midwest, and many came to Wisconsin, whose rich farmlands and rising cities attracted three major waves of immigrants. Today German influence in Wisconsin is still quite apparent, from churches, to food and beverages, to cultural and educational institutions. Learn about the values and ideas the Germans brought with them from the Old Country, including their achievements on the farm, in the workplace and in academia over the course of 150 years in Wisconsin. By Richard H. Zeitlin Paperback; 72 pages, 35 b/w photos and illus. Have Norwegian heritage? 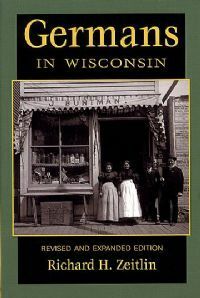 This book offers a concise introduction to Wisconsin's Norwegian immigrants, examining the mass migration of Norwegians to WI during the 1800s. Read about the causes that impelled Norwegians to come to places like Monroe County, Wisconsin, their dangerous Atlantic voyage, and the establishment of Norwegian communities in the state. 72 pages, 39 b/w photos and illus. By Richard J. Fapso. Hundreds of thousands of ordinary men and boys fought and died during the Civil War. This includes 1500 from Monroe County. 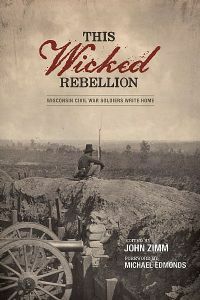 "This Wicked Rebellion" by John Zimm tells their story. Drawing from more than 11,000 letters in the Wisconsin Historical Society's Civil War collection, the book gives a unique and intimate glimpse of the men and women who took part in the War for the Union. Follow Wisconsin soldiers as they sign up or get drafted, endure drill and picket duty, and get their first experiences of battle. Join them as they fight desperation and fear, encounter the brutality of slavery, and struggle with the reasons for war. 240 pages, 33 b/w photos and illus., 6 x 9". Hardcover. Sparta, WI is known as the, "Bicycling Capital of America." But, did you know that Wisconsin itself is an important bicycling state? There's a complex and fascinating history behind the popularity of biking in Wisconsin--one that until now has never been told in depth. 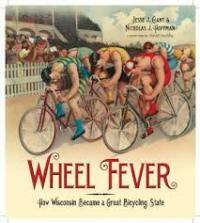 Meticulously researched through periodicals and newspapers, Wheel Fever traces the story of Wisconsin's first "bicycling boom," from the velocipede craze of 1869 through the "wheel fever" of the 1890s. The book, full of fascinating historic imagery, examines the origins of bicycling in Wisconsin and why those origins still matter, but it is also about our continuing fascination with all things bicycle. From "boneshakers" to highwheels, standard models to racing bikes, tandems to tricycles, the book is lushly illustrated with never-before-seen images of early cycling and the people who rode them. 256 pages, 190 color and b&w photos. By Jesse J. Gant and Nicholas J. Hoffman. Softcover. 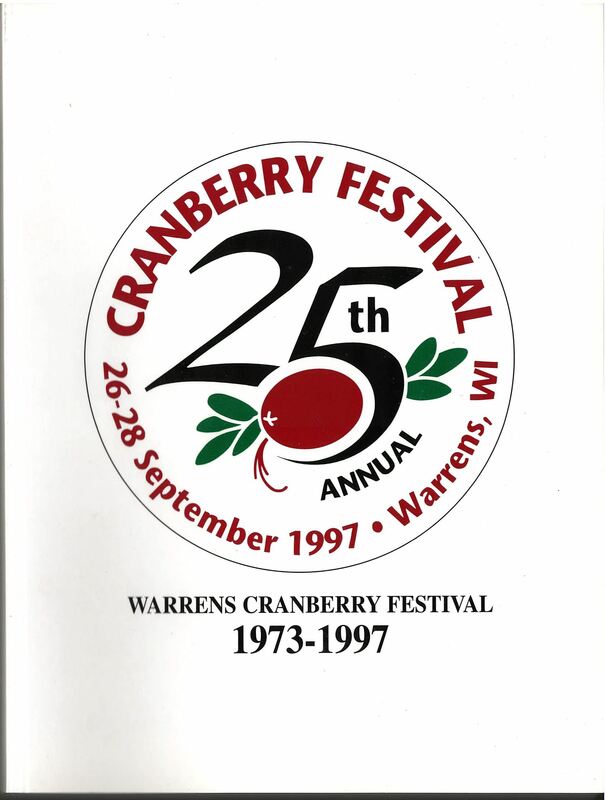 “Warrens Cranberry Festival: 1973-1997.” An in-depth look at the “World’s Largest Cranberry Festival.” 450+ pages full of stories and pictures (both color and b/w) chronicling the first 25 years of this significant festival. 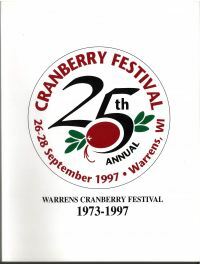 Topics include: festival history, past royalty, parades, the arts & crafts show, and more. Soft cover; 451 pages. Want to know more about Monroe County's Ho-Chunk Nation and other WI Indians? This unique volume, based on the historical perspectives of the state's Native peoples, includes compact tribal histories of the Ojibwe, Potawatomi, Oneida, Menominee, Mohican, Ho-Chunk, and Brothertown Indians. Author Patty Loew focuses on oral tradition: stories, songs, the recorded words of Indian treaty negotiators, and interviews, along with other untapped Native sources, such as tribal newspapers, to present a distinctly different view of history. Elders and tribal historians in each of the Native communities participated in the book's development, recommending sources, making suggestions, and offering criticism as the book unfolded. 208 pages, 142 color and b/w photos, 8 x 9" softcover. 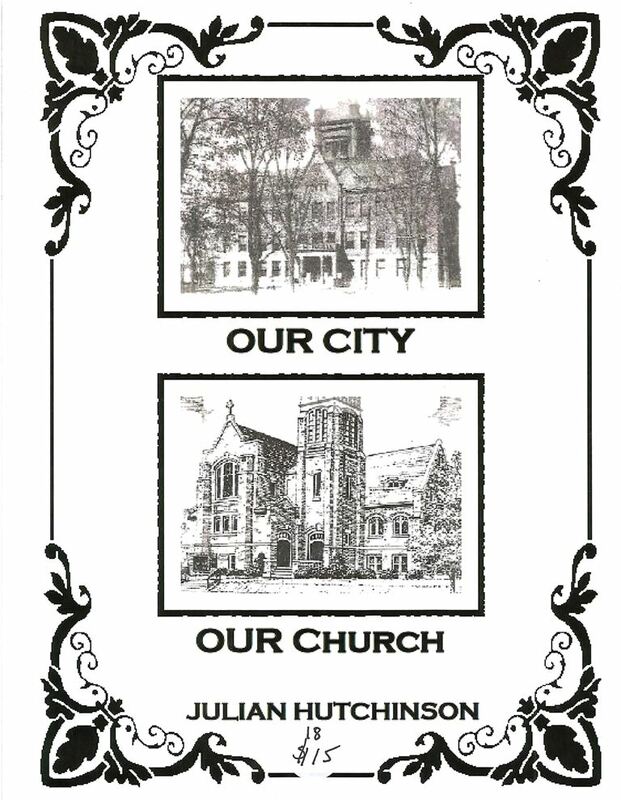 "Our City...Our Church" is a history of Sparta and the Sparta United Methodist Church by Julian Hutchinson, 2017. It is a collection of 51 articles written by Julian Hutchinson at various times for the "Sparta Times Past" column of the Sparta Herald newspaper and the "Did You Know...?" section of the Chimes newsletter of the Sparta United Methodist Church. The articles cover significant people, places and events in the church's and city's respective as well as overlapping history. Includes several black and white and color photographs. Softcover, 115 pages. "Elm Grove School, Big Creek, Wisconsin" is a compiled collection of photos, documents, and memories of the Elm Grove School in the Town of Sparta by Jackie (Kirkeeng) Everson and published in 2017. Spiral-bound, full-colored pages. All proceeds support the Monroe County Historical Society and Big Creek Church. You may have noticed the many barns dotting the Monroe County landscape. Digging deep as both a barn enthusiast and a farmer, author Jerry Apps reaps a story of change: from the earliest pioneer structures to the low steel buildings of modern dairy farms. They've housed wheat, tobacco, potatoes, and dairy cows, and they display the optimism, ingenuity, hard work, and practicality of the people who tend land and livestock. Featuring more than 100 stunning full-color photos plus dozens of historic images, "Barns" explores myriad barn designs, from rectangular to round, gable roof to gambrel, and fieldstone to wood, always with an eye to the history and craftsmanship of the Norwegians, Germans, and others who built and used them. By Jerry Apps. Photos by Steve Apps. Hardcover; 224 pages, 140 color and b/w photos and illus. Before tractors or steam engines arrived on the farm, horses did all the heavy work. From spring plowing to the fall harvest, the mighty draft horse powered farms across the Midwest. 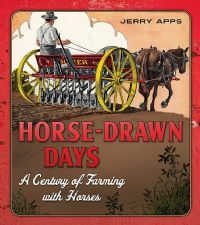 "Horse-Drawn Days" captures stories of rural life at a time when a team of horses was a vital part of the farm family. 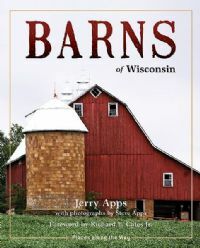 Author Jerry Apps pairs lively historic narrative with reminiscences about his boyhood on the family farm in Wisconsin to paint a vivid picture of a bygone time. Featuring fascinating historic photos, ads, and posters, plus contemporary color photos of working horses today, "Horse-Drawn Days" evokes the majesty of these animals and illuminates the horse's role in our country's early history and our rural heritage. By Jerry Apps Paperback; 216 pages, 140 b/w and color photos and illus. 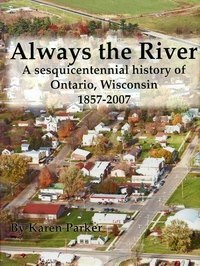 "Always the River: A History of Ontario, Wisconsin, 1857-2007” (2006). Take a stroll back in time to pioneer Ontario, the liveliest town on the Kickapoo. Read about hardy men and their families who settled in the area to harvest timber and float it down the Kickapoo River. Learn about the ravaging floods that nearly destroyed the village. Observe Ontario's evolution from a lumber town to an economic center for area farmers to its current role as a gateway to canoeing and recreational opportunities at the Kickapoo Valley Reserve and Wildcat Mountain State park. Loaded with historic black and white photographs. 106 pages. 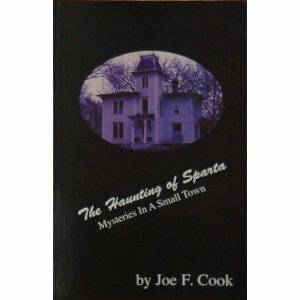 “The Haunting of Sparta: Mysteries In A Small Town” (2009). Heard any good ghost stories lately? 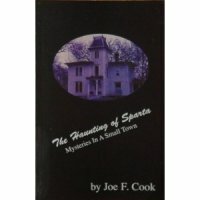 Local author Joe Cook has, and he compiled those spooky stories into one book. “Every small town has its mysteries, old structures that captivate passersby from one generation to the next. ‘The Haunting of Sparta’ explores the intriguing possibilities that some things in life are unexplainable.” 101 pages long with numerous black and white images. 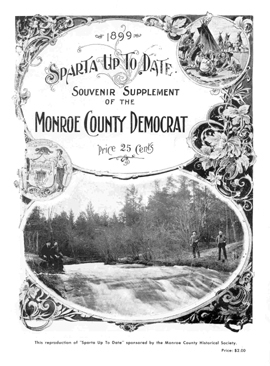 Sparta Up To Date: A Souvenir Supplement of the Monroe County Democrat, 1899 (reproduction). 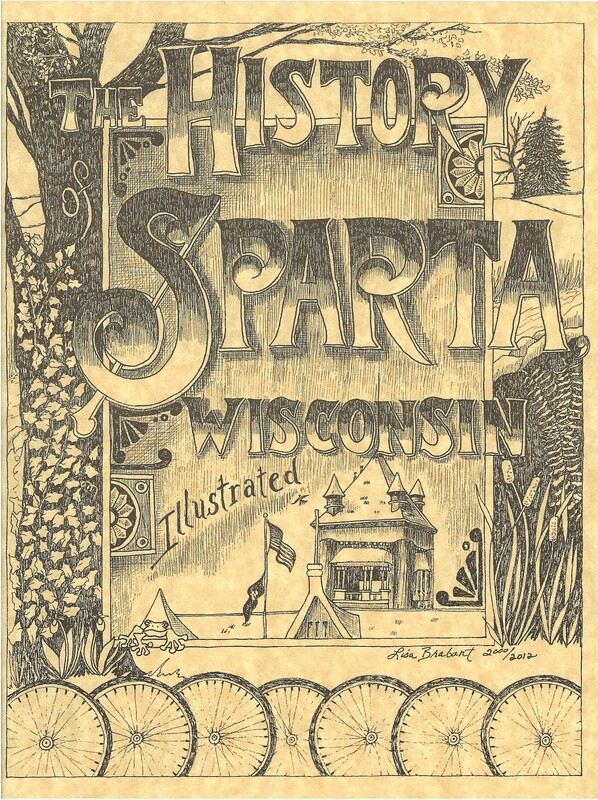 48 pages This historical gem includes short histories of businesses, schools, churches, and various organizations, as well as biographies of notable Spartans (businessmen). Loaded with glossy photographs of buildings, houses, people, store interiors, events, and more! Logging Dilemma In The Big Swamp (1995). 236 pages. Details the early logging history of southeastern Jackson County, WI. Prior to European settlement, the area was dominated by large white pines, which were prized by loggers during the 1880s when sawmill towns and their railroads dotted the area. 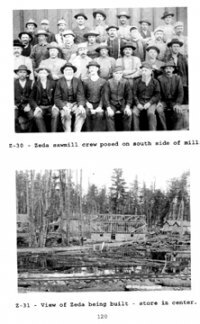 In Eastern Jackson County the communities of Goodyear, McKenna, Zeda, Bear Bluff Station and Chaplin boomed during logging days. Includes 124 historic images. 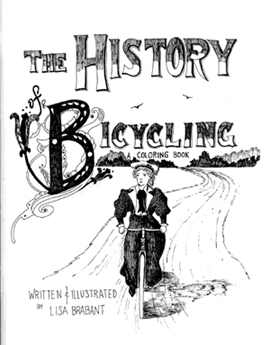 History of Bicycling Coloring Book, by Lisa Brabant (1995).44 pages. Whimsical look at the history of bicycling, illustrated with sketches kids can color. The Illustrated History of Sparta, 2nd Ed., by Lisa Brabant Gaunky (2012). 44 pages. A history of Sparta and the surrounding area featuring the settling of the area and many of Sparta's notable buildings. 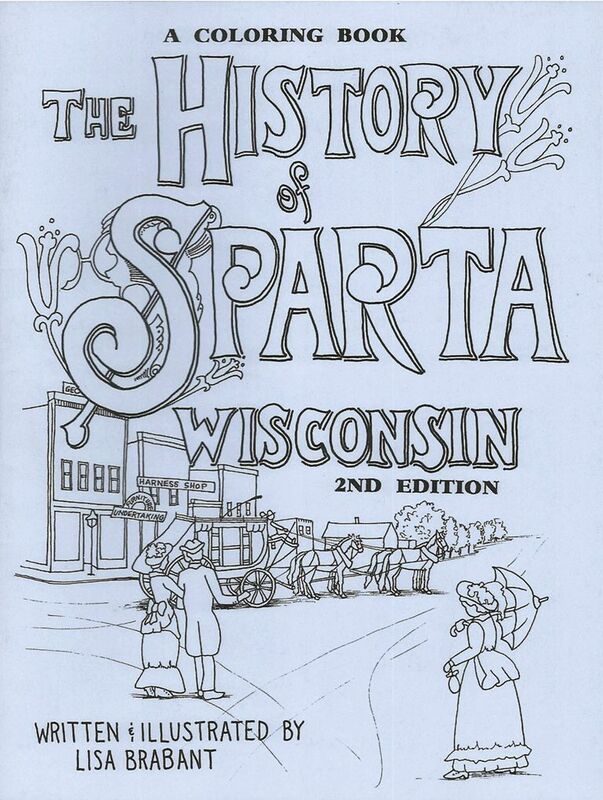 History of Sparta WI Coloring Book, 2nd Ed., by Lisa Brabant Gaunky (2000). 44 pages. 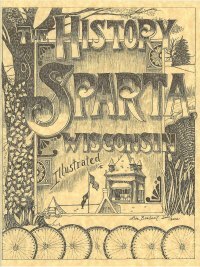 A history of Sparta and the surrounding area from Native American home to "Bicycling Capital of America." Created for kids to read and color! Sparta Fire Department History: 1879-1979 (1979). 100 pages. 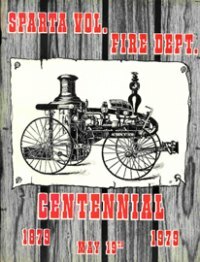 Includes stories about major fires in the area, roster of men who served in the department, and dozens of photographs. 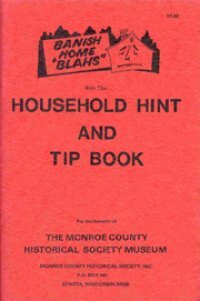 Household Tip Book features over 300 useful tips, tricks, and old-fashioned home remedies. 50 pages. 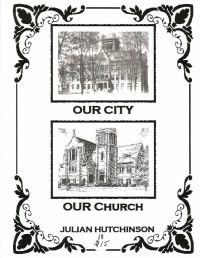 Published by the Monroe County Historical Society in 1975. Monroe County Veterans, Diane Hanson & Pat Mulvaney (2000). 63 pages. 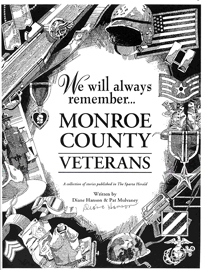 Contains the riveting stories of 39 World War II-era veterans from Monroe County. Many photos included.